Contact me if you'd like to book an interview, signing, reading, a feature on your blog, review, spotlight, or interpretive dance. Mar 23: Tony Ortega's Underground Bunker with an except from the book. April 1: Shana Nys Dambrot's "Meet the Artist Monday" in the LA WEEKLY. April 6: On Sale Date! 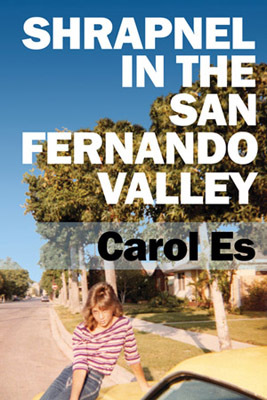 Purchase Shrapnel in the San Fernando Valley on Amazon. ALSO: Interview with mjp's THIS IS NOT A TEST--the 100th episode (podcast). See an excerpt from the book here: On a Reading Bender. Another book excerpt: Beach Bound Books. April 8: Spotlight on Book Addict. April 9: Interview with The Avid Reader. April 10: Spotlight on Jazzy Book Reviews. April 11: New book review on Texas Book Nook. April 12: Spotlight on 100 Pages a Day. April 15: Interview on A Life Through Books. April 16: Spotlight on Tea Time & Books. April 17: Review by Truly Trendy. April 18: Spotlight on T's Stuff. April 19: Review on Novel News Network. April 22: A Spotlight on Book Love Blog. April 23: Review with Mama and her Stories. April 24: Spotlight on Dina Rea's Write Stuff. April 25: Review: The Indie Express. April 26: Spotlight on Mama Says to Read or Not to Read. May 6: Book Feature & Tour Kick Off at PUYB Virtual Book Club. May 7: Feature on Readeropolis. May 8: Book Teaser on PUYB Teasers. May 9: Interview on Momma Says: To Read or Not To Read. May 10: Book Review on Sefina Hawke's Books. May 13: Interview at The Writer's Life. May 14: Interview on The Dark Phantom Reviews. May 15: Interview on Literally Speaking. May 16: Interview at Blogging Authors. May 17: Interview at T's Stuff. May 20: Interview on I'm Shelf-ish. May 21: Featured on Book Bloggin Princess. May 22: Featured on She Writes. May 23: Interview on Nuttin' But Books. May 24: Book Review on Books for Books. May 27: Interview at Confessions of an Eccentric Bookaholic. May 28: Interview on Blogger News Network. May 29: Featured on My Book Launch. May 30: Featured on A Title Wave. May 31: Book Review on Mama Panda Bear.